At an age when most are considering retirement, Emma Hudson Eagle took her first job outside her home. She was 53 when she became the first matron of the King's Daughters Cottage at the Stonewall Jackson Training School in 1911. "She went to an old log school house with an immense log fireplace at one end. One long desk was nailed to one side of the room and there the older students sat to do their writing. The others sat on crude, backless benches made of slabs with legs made of poles. Her first teacher was a schoolmaster named Robert Brown and he had between 75 and 80 children on his roll...her last teacher being James C. Fink, who at the time was but little older than herself." As her siblings left home, Emma stayed as a companion and caretaker of her mother. After her mother's death, Emma married widowed farmer Joseph Travis Eagle, Sr. in 1903 when she was 45. For the next seven years they lived at his home in Rowan County. Joseph, who was 18 years her senior, died in 1911. Emma then returned to Concord. It was at this time Emma was hired as a matron at Stonewall Jackson Training School. Considered a pioneering progressive institution, the school was established as a reformatory for troubled young white males to separate them from adult institutions. Its founding was the result of twenty years of organizing by women's groups in North Carolina. Although she left several times to care for family members, over the next 20 years Emma served in various capacities at the school, primarily as a matron and director of the Sewing Room. She watched the school grow from two residential "cottages," or homes, housing about sixty boys, to fifteen cottages with nearly five hundred. The King's Daughters cottage, where she first worked, was named for the organization which donated the funds for its construction. Erected in 1908 and opened January 12, 1909, it was built of solid brick and a slate roof. All the cottages were similar in size and interior arrangements, equipped to accommodate about 30 boys. Each had two stories and a basement. The basement contained a pantry for food supplies, a locker room, a clothes room, and bathroom and bathing facilities. On the first floor of each cottage was a kitchen, dining room and sitting room for the boys and cottage parents. The second floor had a dormitory for the boys and living quarters for the cottage parents. the Stonewall Jackson Manual Training and Industrial School (1946). The cottage matron was to act as a mother to the boys. According to History of the Stonewall Jackson Manual Training and Industrial School (1946), "she cultivates an appreciation of neatness and cleanliness, and through her high ideals she promotes a cooperative spirit among the boys. She sets the standard for happy home life in the cottage." Duties included supervising food preparation, cooking and dining activities, managing supply orders, directing and assisting with mending of clothes and linens, overseeing bedroom cleanliness, teaching good table manners and courtesy, and taking care of all indoor recreational activities and playthings. 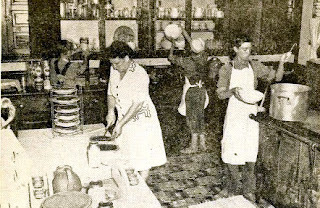 Stonewall Jackson Manual Training and Industrial School (1946). 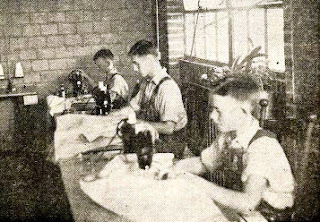 One of the chief functions of the program at the Jackson Training School was to provide trade training and work experience. Emma became the director of the Sewing Room. Its primary purpose was to make new garments and mend worn garments. Among the items they made were: shirts, pajamas, sheets, towels, pillow cases, aprons, table linens and window curtains. Items for mending were such things as shirts, overalls, underwear, coats, sweaters and athletic goods. The boys learned such skills as cutting patterns, operating sewing machines and button hole machines, and hand sewing. They also learned to sort out materials and classify finished articles. Such learned skills were practical and could be applicable for textile mill work. Emma Hudson Eagle was a devoted member of Rocky Ridge Methodist church and the Women's Missionary Society and was known for her talents in crochet and quilting. Although she had no children of her own, she cared for many. She died 28 Nov 1944 at the age of 85 and is buried at Oakwood Cemetery in Concord. The original cottages of the now named Stonewall Jackson Youth Development Center are no longer used and have fallen into disrepair and neglect, however, they are listed on the National Register of Historic Places. "Tribune's Minute Biography," The Concord Tribune, 3 Dec 1939.